WASHINGTON (Army News Service, June 27, 2008) – One of the most popular therapists at Walter Reed Army Medical Center prefers to show his enthusiasm and appreciation by wagging his tail and giving slobbery kisses. Deuce is a three-year-old chocolate Labrador retriever and the first therapy dog assigned to a U.S. military hospital. 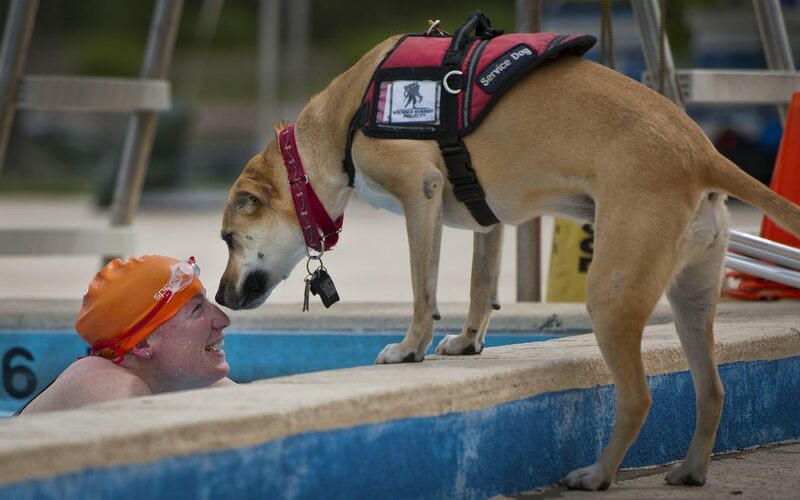 Walter Reed is the only military hospital to use therapy dogs, according to Deuce’s owner, Harvey Naranjo, who is in charge of adaptive sports and community reintegration programs at the hospital. “We had just started a program where we take our servicemembers to ride horses as part of their therapy to work on their core…While we were there, they had some dogs running around in the barn,” Naranjo said. “And I just saw how our guys, how our patients, opened up to the dogs and all of a sudden you saw these tough guys just totally melt. After breaking through a lot of red tape, Deuce, who was originally trained as a service dog, arrived at Walter Reed about two years ago. He goes on walks with patients who are missing legs, both to encourage them to get out and get accustomed to walking dogs they might already have. He plays fetch with patients who are missing arms so they can learn how to use their prosthetics and throw the ball. He lets patients lean on him for balance during therapy exercises. He even runs in marathons with the wounded Soldiers. But most importantly, Deuce’s job is to bring smiles to patients’ faces and help them forget where they are. He was clearly the center of attention in Walter Reed’s occupational therapy gym Tuesday as wounded Soldiers and staff members stopped to rub his ears and sneak him treats. The program has been so successful that Walter Reed added another dog, and a third will start in the Fall. The dogs alternate days, and Naranjo said Deuce loves working so much he gets upset when he has to stay home. Other patients in the hospital are visited once or twice a month by dogs and volunteers from People, Animals, Love (www.peopleanimalslove.org), an organization that trains therapy dogs. The dogs, who are in good health and bathed just before their visit, visit in-patients and the pediatric ward. The therapy dogs were such a success at Walter Reed, according to Naranjo, that program has referred about 20 servicemembers for personal service dogs. After losing both legs to a land mine in Afghanistan, Cpl. Sue Downes received Lyla, a 2-year-old yellow Lab, through the Canines for Combat Veterans program. The program is run by National Education for Assistance Dogs Services, and Lyla was actually trained by an inmate in the prison pups program. A $25,000 donation to the Tower of Hope organization covered Lyla’s training, food and other needs. Another donor awarded Lyla free veterinary care for life so Downes isn’t responsible for any costs associated with the dog. Downes has been at Walter Reed for a year and a half and she said Lyla — who wears a service-dog vest Downes made out of her own uniform — has made a huge difference in her life. Lyla lets Downes lean on her for balance or for help standing up. The dog turns off the light at night and brings the spray bottle of water Downes needs to fit into her prosthetics. In fact, when Downes took the spray bottle out of her purse and set it down, Lyla immediately picked it back up and gave it to her. Even after Downes assured her it was okay, Lyla continued to watch the bottle for several minutes before disappearing under Downes’ seat until she was needed again. “Before, I wouldn’t enter the hospital by myself unless I had somebody with me,” Downes said. “Now that I have her, I come in by myself a lot of the time. Just more confidence knowing someone’s there. She’s there to help me if I fall, things like that. Although Lyla knows she has a job and belongs to Downes, Downes added that Lyla is also a regular dog and a great pet for her 7-year-old son and 9-year-old daughter. She does tricks and loves to play tug-of-war. Two other dogs have deployed to Iraq with combat-stress units to help Soldiers relax and give them a little piece of home. “You have areas where occupational therapists in theater have to go and assess combat-stress situations where there may have been a death in the unit,” said Naranjo. “Soldiers have been on constant deployments in areas where they haven’t had access to their families, with a phone call or whatever.